June 13th, 2017 – Attorney General Jeff Sessions recently submitted a letter asking certain members of Congress to remove federal protections that prevent the Department of Justice from cracking down on medical marijuana patients, cultivators and dispensaries that are in line with state laws. Under the Rohrabacher-Farr amendment, which passed in 2014 and was recently renewed by Congress, the DOJ is prohibited from spending federal money to interfere with state-level medical marijuana laws. Sessions sent the letter in May and it was later obtained and released on Monday by marijuana newsite Massroots.com. In it, the attorney general said that the amendment inhibits the department’s ability to properly enforce the Controlled Substance Act, under which marijuana is listed as a Schedule I drug. “I believe it would be unwise for Congress to restrict the discretion of the Department to fund particular prosecutions, particularly in the midst of a historic drug epidemic and potentially long-term uptick in violent crime. 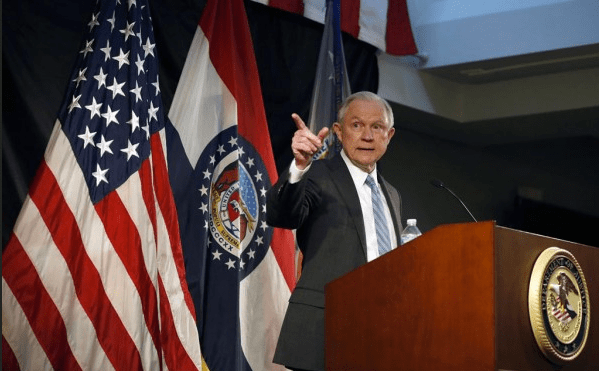 The Department must be in a position to use all laws available to combat the transnational drug organizations and dangerous drug traffickers who threaten American lives,” Sessions wrote. Thirty U.S. states have laws allowing patients with a variety of conditions to use medical marijuana as a form of treatment, and support for medical marijuana has continued to increase countrywide. An April Quinnipiac Poll found 94 percent of voters favored allowing patients to use medical marijuana for medicinal purposes with a doctor’s prescription, and 73 percent favored reducing marijuana from its Schedule I drug status. Contrary to Sessions’s remarks regarding the drug epidemic sweeping the nation—which is actually in reference to the ongoing opioid and heroin crisis—there have been several studies cited by the National Institute of Drug Abuse (NIDA) that list medical marijuana as beneficial in opioid death and overdose reduction in states that have medical marijuana laws.